I installed a new heating system with an inderct tank about 8 months ago. The existing WM cast iron boiler was beyond repair to many leaks. I installed a Baxi 1.33 GA with a Steanless Steel tank Modulo 2. Back just before Thanksgiving I was called out because the hot water was getting rust color. The rod was gone so I drained down the tank and vec. it out and instaaled new one. I just went out again this weekend and the same thing. Had to install new rod. I am not using dielectric unions I am using the piping kit that goes with Baxi boiler and tanks. I know some brand names in the past didn't want them at all it voided warranty. I told the home oner to get ahold of power complany to check things out als try to get election. I did check the ground at water meter it looked good but I am plumber not elections. Any other thought Thak for your time. I would jumper hot and cold water at the water heater with a ground wire. minimum #8copper for 100 amp service or #4 for a 200 amp service. I would also get the water company there to take a look. See if they have had similar issues and what they do about it. 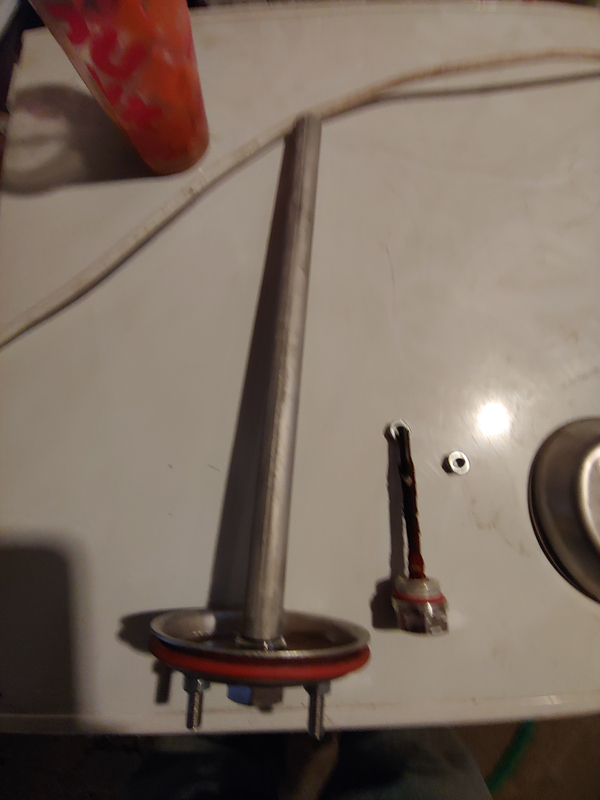 Hello, You might want to consider using a powered anode rod like CerAnode: http://ceranode.com/index.php?page=domestic-water-header-anodes , Corro-Protec: https://www.corroprotec.com/ and AO Smith has on as well, though I don't find a link. I forgot to say the house has a water filter system. A basic filter, a carbon filter with back wash, and a water softer with salt. This system does have a copper bypass so there are no breaks in system for the grounding wire. Sorry at this time no photos of installing system with filter. Hi, Salt softening can reduce the anode to a bare wire in six months. You want to leave 60-120 ppm of calcium carbonate hardness in the water after softening. Softener guys often like to soften down to zero. So the company that maintains the filter system had it set at 20PPM. They also brought in there own electrical contractor and made some changes with grounding at water meter and out side grounding rod. But he did not have anything to test system is what I was told. Hello, It's the National Association of Corrosion Engineers who came out with the 60-120 ppm suggestion. This system is set at 1/3 of the low recommendation now. Maybe send out a water sample to get it tested? ps, Salt softening basically replaces calcium with sodium, which is more conductive and leads to anodes being used up fast. I seldom see an anode last over two years in softened water, while I get 6-7 years in naturally soft water.